Worshippers who attended Night of Percussion praise night at God's Signature Royal Assembly in Ota had a great and rewarding time in the presence of God. The event which took place on the 20th of July had in attendance gospel artistes like AYAN JESU, BOLA DADA - KAAKAKI JESU, OBIBI JOHN, JUMOKE, TAIWO OJODU, BUKOLA CRYSTAL, JOBA I-AM and a host of other choral groups. The Senior Pastor of God's Signature Royal Assembly, Isaac Ogbah stressed the need to always praise God. He recounted how God has been faithful to him and the church of God. Rev. Wale Akinronbi in his brief but power filled sermon emphasised that when we worship and praise God, it's an indication that we have not lost our memory. 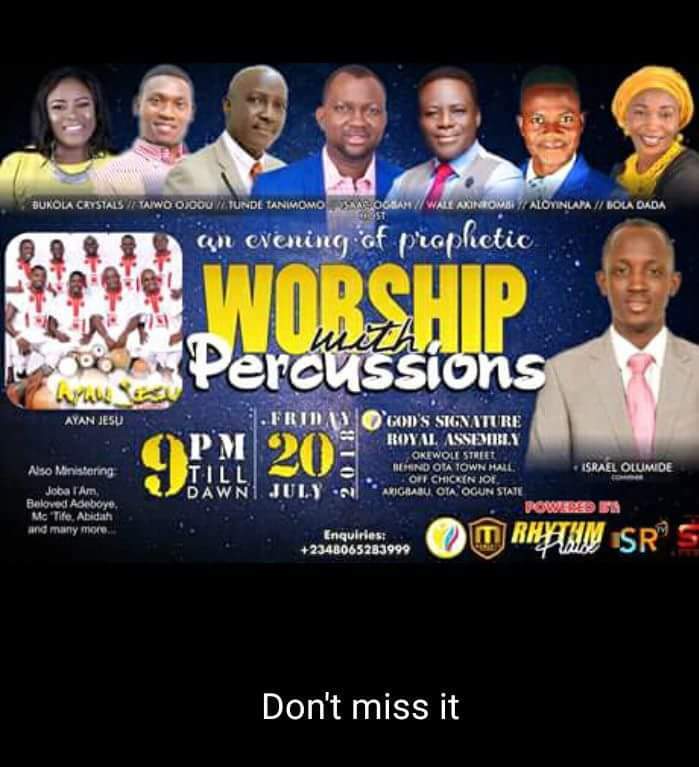 The convener of the programme, Pastor Israel Tanimomo broke a record of not just organizing the biggest Praise Night of Percussion but also for organising the first Gospel Music Awards in Ota. Under his record label,Medley Records, Awards were presented to those who have excelled in their calling as Music Ministers, Comedian, Promoter and supporter of Gospel Music Industry in Ota. Some of the recipients of the Awards include Asiwaju Abayomi Oke of Novent Concept, Parkhage, Obibi John, MC Tife, Rev. Tunde Tanimomo & Damie Lasisi.